ESC Staff with the Halloween Spirit. Trick-or-treat with friends. There is safety in numbers. An adult should accompany young children. Trick-or-treat during daylight. Carry a flashlight in case it gets dark. Look both ways before crossing the street and always use crosswalks. Visit homes with porch lights on which welcome you. When trick-or-treating with friends, tell your parents where you will be going. Bring your treats home and do not eat anything until your parents have checked it. If any treats look suspicious, have your parents call the police. Of course the above are tips for children; however some of them can be carried over into daily lives and the lives of those of us adults. Things like using crosswalks and being visible to traffic are things that we all need to do, especially when we are at work. Everyone at Evergreen Safety Council hopes that your family has a safe and fun Halloween. Demand for occupational safety and health services will soon exceed the supply of trained and experienced professionals, according to results from a new NIOSH survey. The national survey (.pdf file), commissioned by NIOSH in 2008 and performed by an independent firm, found that employers plan to hire at least 25,000 safety and health professionals over the next five years, but less than 13,000 new graduates are expected from academic programs. In addition, NIOSH said many of the projected vacancies likely will be filled by current employees or workers without occupational safety and health training. The need for more trained professionals is especially great given the pending retirement of older safety professionals and new technologies that require specialized skills and knowledge, NIOSH Director John Howard said in an agency press release. • Degree programs in occupational safety and health have experienced declines in university funding, especially those not funded through NIOSH. • Employers want new graduates to have training in leadership and communication. Are you looking to move into a Safety & Health career? Evergreen Safety Council's Safety & Health Specialist certification series, as well as our more advanced Health & Safety Technician certification series can help. Call or email Stephanie Dyck 800-521-0778 for more information and to request an information pamphlet today. Before the Snow Flies, Are Your People Ready for the Road? Winter is approaching, so let’s get ready... let’s get prepared for some of the trickiest driving we ever face. 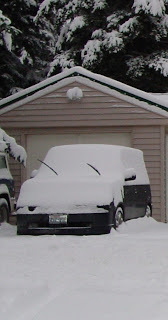 Perhaps the most important tip I can give about winter driving is: think ahead - be prepared. How many times have you heard someone complain about hitting a patch of black ice and skidding off the road (or almost off the road; or into another car; etc.) on their way to work in the morning? And yet, most of those drivers had to scrape ice off their windows that morning. If they had to scrape ice off the windows, do you think that might have been a good warning there could be ice on the road? And even if you park in a garage or underground parking lot, think about the road conditions before they take you by surprise. When ever I pull out of my underground parking in the winter, and there might be even the slightest chance of icy or frosty roads, I check it out. Before even getting on the main roads, I'll brake heavily to see if the car skids easily. I figure it's better to know early, than to wait until the first intersection to find out it's so icy I can't stop. Being prepared also means having your vehicle prepared. Make sure your visibility is unimpeded. How many times have you seen people driving in the winter with snow stacked up on top of the hood and covering the windows, headlights and taillights? 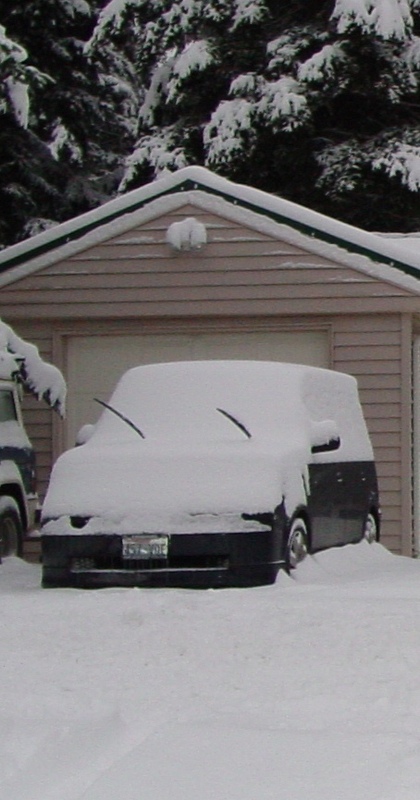 It only takes a couple of minutes to clear the snow off; and be sure to defrost the windows. It's going to be a long commute. You should also check the condition of your windshield wipers, and make sure you have lots of windshield washer fluid. Obviously, it's important to have good winter tires on your vehicle. Before buying winter tires, talk to a knowledgeable tire dealer. They can make sure your tires are the correct size, type and properly inflated. In fact, check your tire pressures more often during the winter, as the temperature changes can affect them significantly. Many people will tell you to add weight to the rear of your car - putting sand bags or whatever in the trunk. That's not bad advice - sometimes. First of all, it doesn't work with a front-wheel-drive vehicle. I don't know how many times I've talked to people driving front-wheel-drives who have put weight in the trunk. Remember, the reason for this is to add weight - and therefore traction - to the driving wheels. That doesn't work when the driving wheels are in front! If you do have a rear-wheel-drive vehicle, don't put the weight at the very rear of the trunk. If you do, and the car begins to skid, all that weight hanging way out the back will act just like a pendulum, making it even more difficult to control the skid. Instead, if you add weight, place it as far forward in the trunk as possible - preferably directly over the rear axle. It's a good idea to keep a blanket, extra clothes and boots in your vehicle, in case you do get stuck. Also keep a candle, matches, flashlight and even food - especially if you're planning a long winter trip. And of course, it's smart to carry a shovel, sand and chains in the trunk. For more traffic safety resources or to schedule a seminar at your location, contact Tina Bacon at 800-521-0778. Reckless homicide of a construction worker = 3-14 years in prison. Reckless homicide of two or more construction workers = 6 to 28 years in prison. In other words, mess up driving through a work zone and go to jail. I like this, even though I am not a fan of new laws. I’ve been a target out there, and some drivers need to be slapped hard when they mess up in a work zone. Check out this link to see a summary of all the states with laws that protect work zones. Sometimes a solution is "right before your eyes"
When Walter G. King was a young man, in Cleveland, in 1881, he joined his father's optical company, as a salesman. Not too extraordinary, until you learn that the company manufactured glass eyes. Business was good, perhaps too good. The turn of the 19th to the 20th century brought an era we refer to as the industrial revolution. More people were working at the higher paying, but more hazardous jobs in heavy industries. Walter was bothered by the fact that literally thousands of their company’s glass eyes were being shipped to industrial areas. He did a bit of investigation, and as he feared, most of the purchases were for workers who had lost their eyes in industrial accidents. Even though it would mean a drop in his father’s business, Walter determined to prevent these disastrous injuries caused by flying pieces of metal and particles of emery dust. Walter had heard about slit-type goggles that polar explorers found Eskimos wearing to avoid snow blindness, and in 1905 he adapted that device to industrial use; great idea, too bad it didn't work very well. Lenses of thick glass might dork, so the next year working with engineers of the American Optical Company, Walter developed a safety goggle using tempered glass. A Cleveland foundry that made steel castings for railroad cars ordered six dozen pairs for trial testing. Crude as these were, the customer reported a month later that the goggles had saved the eyes of 20 of the workers by withstanding the impact of flying metal chips. Some of the lenses were shattered, yet all the glass remained in the frame, and most importantly, except for a few bruises the workers were not injured. Trainer Al Filmore models his safety goggles. As use of Walter's goggles spread, and even with proven success, some workers would wear them when the "boss was watching" but slip them off when the foreman wasn't looking. They claimed the goggles were uncomfortable, and they could "see better" without them. Some companies made it mandatory policy that anyone caught without goggles at an operation where goggles were required would be fired! Even today, company safety rules or policies, that are more protective than either State or Federal rules, continue to be used, and continue to save lives and prevent injuries. Walter King's company continued to develop other forms of eye protection, including the first successful "welding" lenses, to shield workers from the harmful ultra violet and infrared rays given off by molten metals. Walter King's efforts were recognized by the American Museum of Safety when it awarded him its Gold Medal in 1916, in recognition of all the measures to protect the eyesight of industrial workers, developed by his company. It was a unanimous vote, "the eyes have it!" Why are accidents increasing after the texting ban? Almost lost in the sea of press releases, in September 2010 Highway Loss Data Institute issued one regarding crashes and the banning of texting while driving. Who knew that in the 4 states where they studied crashes before and after the ban they found that in 3 out of the 4 states crashes increased after banning texting while driving. One more thing, I am not saying we should change the law, I am saying that every one who drives needs to PAY ATTENTION. This means watch the road not your passenger, not the GPS, not your food or whatever. You are driving a 2 ton deadly weapon (or larger) and they will kill. It is every drivers responsibility to stay focused. So if you cannot focus when you are driving, do all of us who do a favor... STAY OFF THE ROAD OR TAKE THE BUS. As you read this, the darker, drizzlier, fall weather is upon us. We take other precautions with respect to the changing seasons, so let’s extend that thought, and review some of the skills and precautions necessary to drive safely in darkness. There are times when we anticipate and sometimes are fearful that we will encounter a known hazard. I once lived in an area labeled as a “range area”; livestock often would escape their fenced pastures and cross the road. The problem was not limited to domestic stock, but the local deer seemed to enjoy the company of the cattle, and I expect their abundant food source, as well. A dark colored animal; a cow, horse or even pigs, can be nearly impossible to see under certain conditions, unless they turn their heads and you can make out the “glow” of their eyes (the light reflected by your headlights) The northern states, several provinces of Canada and Alaska have specific traffic rules for avoiding encounters with moose. The physics of a speeding automobile colliding with a one-ton moose are impressive. I always worried a bit about having a close encounter with one of these animals. Once I was fooled into making a rapid stop, only to find that the “deer” I thought I saw in the road way was just a trick of the shadows and reflections on the wet road surface. I guess you could say I thought about it so much, my mind conjured up the very image I was hoping to avoid. No one was with me at the time, so I thankfully didn’t have to explain my near panic stop. Fatigue can often increase the occurrence of “road phantoms”. We often feel pressured to make “just a few more miles” but that only makes the problem worse, as the farther we drive, the more fatigued we become and not only do our eyes play tricks on us, but our perception time and reaction time is also reduced, making taking evasive action, when really needed, even more delayed. Use your low beams on sharp curves – Negotiating a sharp curve and the posted speed limit, at night can lead to being surprised by an on coming car, maybe crowding the center line. The gleam of your high beams will washout the glow of the oncoming car’s lights, you simply won’t know they are there until you are nearly on them. To warn on coming drivers on a sharp curve, flick your lights from low to high and quickly back to low again – A retired highway patrol office, suggested this technique, “It changes the intensity of the light at the apex of the curve, and helps other drivers know you’re coming.” Do this of course only if there are no cars visible, coming toward you. The Washington State Driver’s Guide specifies that you must dim your lights at a minimum of 500 ft from any approaching vehicle. 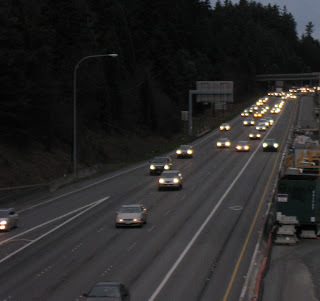 Increase your following distance at night – There are two good reasons to do so: The Washington Driver’s guide suggests 4 seconds following distance under conditions of good visibility – meaning daylight hours. They suggest adding at least another second’s distance after dark or when ever conditions of visibility are impaired by rain, fog, blowing dust or anything that reduces your sight distance. The Washington Driver’s Guide also states that you must dim your lights when following another driver at a minimum of 300 ft behind them. This practice prevents blinding the other driver by temporarily reducing their night vision due to your bright lights. Don’t out drive your headlights – The headlights on our modern cars are much brighter than the lights on older cars; this is both good and bad. While the brighter lights do help us see farther down the road, it can lead to a false sense of security. The driving dynamics of the situation, the speed, weight of the vehicle, the level of attention or distraction of the driver at that moment, taken together may mean we are unable to take corrective or avoidance actions soon enough to prevent a collision. Simply put, if you can’t identify a hazard, (perception time) initiate and actually complete the required emergency action, (reaction time) in the time it takes your car to travel the distance illuminated by your headlight, you’re driving too fast and “out driving your headlights”. Highway engineers have done a good job of making our roads safer with the addition of the road edge stripe (aka “fog stripes”) on the right edge of the roadway, using reflectorized paints and reflectors to make the lane divider stripes, “rumble strips” often on the road edge and at times in addition to the centerline, as well as reflectorized and illuminated road way signs. All of these technical upgrades help but, the final responsibility for safe nighttime driving hasn’t changed: it is still in the hands of the one behind the wheel, just as it was for the generations of drivers that have preceded us. This article was written before Washington state and others made it illegal to text or talk on your cell phone without using a hands-free device. Sadly, even on my commute in today I saw many of the examples described in this article. I also saw a lady with a bouncy, fluffy white dog on her lap, holding an espresso cup in one hand, trying to merge onto the freeway. We are coming to the end of Drive Safely Work Week. Think about the extra things you do while driving down the road. Which ones could wait until you got home or to work? Share with your friends and co-workers (and especially your teens) ideas on ways to reduce distractions while behind the wheel. There seems to be more and more distractions around us each day. Not only are there more traffic and street signs to deal with everyday, but technology is making it more difficult. 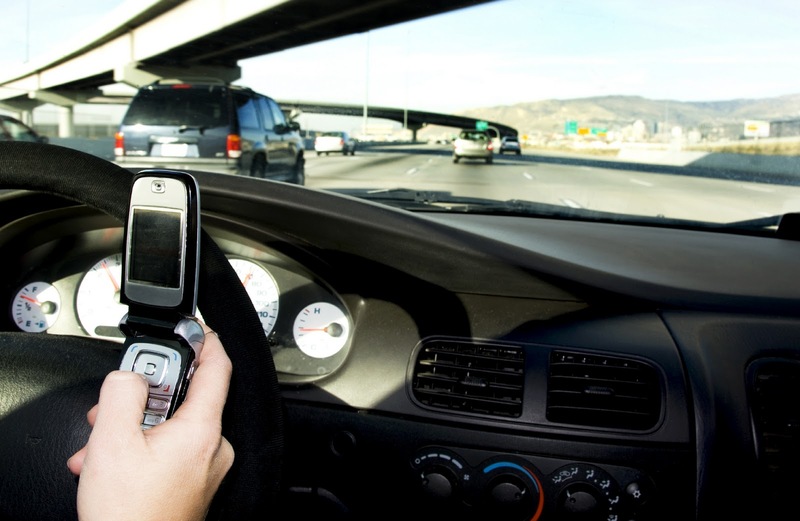 Stereos, cell phones, email-capable phones, and more are becoming common ingredients in our daily driving. With our lives becoming busier and busier each day, we try to accomplish more things while driving. Things like shaving, applying make-up, drinking coffee, and eating are becoming common practice while driving. I'm not saying we all have to drive without looking at, or doing, anything else all of the time. If you're driving in conditions that don't require 100% concentration - light traffic, good weather, open road - there is no reason why you can't do a little more than just drive. In fact, I'm a great believer in the benefits of some of this new portable technology, particularly cell phones. Before using a cell, if I was late for a meeting I would rush to get there. Now, I just phone ahead and explain the problem. Plus, there are many times I've used it for emergency calls. However, with any of these distractions, I think a little common sense is necessary. On rainy days in rush-hour I've seen drivers talking on cell phones while drinking coffee. I've heard of drivers who send and receive faxes or read email while driving on the freeway at 60 MPH. I've seen people eating pizza and listening to their stereo at who knows how many decibels. Who's driving the car? And I'm not talking about just the physical action of driving. I'm talking about the mental side of driving. Driving safely in any condition requires far more concentration than most of us care to admit. Please, if you're going to do something other than drive, use common sense. Pull to the side of the road to make a call on the cell phone; use hands-free; wait until a traffic light to reach into the back seat to grab something; pull to the side of the road to read your email; eat in the parking lot of the fast-food outlet; keep your stereo at a reasonable volume so you can concentrate on traffic around you; and shave or apply make-up at home. If you add up all the time you can save by doing these things while driving, and compare them to the time lost with one minor accident caused by it, you'll be convinced immediately. Concentrate on using common sense. Whether we like it or not, fall will soon be upon us, with the dreary rainy weather we North Westerners call “normal”. Our cars have probably served us well during the summer, carried us on our vacations, or just out for a brief respite from the daily routine. However as colder and wetter weather approaches, our vehicles need a check up to insure they are ready for the more rigorous demands of winter driving. For the “Saturday Mechanic” or even for those of us who rely on someone else to maintain our cars, here’s a list to check to insure our driving safety. Our wipers have sat there, in the sun, all summer long. They have been baked and have lost at least some flexibility, up to being completely brittle and potentially fused to the windshield glass. Give them a thorough check: are the wiper arms bent? Is there sufficient spring tension on the arms to keep the blades in contact with the glass at all times? If the blades are leaving streaks or skipping spots on their arc, they should be replaced. For the most mechanically disinclined of us, most parts stores will gladly install new wiper blades you purchase. Part of summer driving usually means encountering road work, or sharing the road with loaded trucks that sometimes drop gravel or “kick up” rocks from the road. Are there nicks or chips in the glass? Most glass shops will fill those “dings” with a resin that makes the chip nearly invisible, and may prevent the chip from becoming a crack that would necessitate the replacement of the windshield. Cold weather, and the attendant contraction and expansion of the glass when heated by the defroster, tends to cause nicks to become cracks, that are both unsightly but could also impair your line of vision. Check the glass in the mirrors. They too are subject to collecting dings and chips, but even if the “mirror” itself is not damaged, the mirror may not hold the adjustment you need for a clear view behind you. Are the exterior mirrors mounted tightly? An inside mirror usually has a means of tightening the arm to hold it in the position you need. While you are checking, remove the extra stuff you have dangling from the mirror; at best they can be a visual distraction, at worst they are sometimes large enough to block a significant arc of your vision. Are the washer nozzles clear? If not, you can probably open them with a thin piece of wire. Is the washer reservoir both intact (not cracked, and cap not missing) and clean? The washer fluid tank can usually be removed and washed out, and of course refilled with clean washer fluid. For winter driving, always use an antifreeze washer fluid. This will not only keep the system functional, but may help remove the ice buildup on the windshield that may accumulate as you drive. Many modern cars have defrosters that provide heat to clear the windshield nearly instantly – this is a great safety feature! But defrosters rely on ducting that carry the warm air to the windshield. 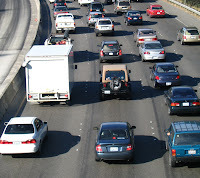 At times the duct may drop loose from the connection that spreads the warm air to the windshield, or may have cracks due to age or other damage. Hold your hand on the defroster outlet; do you actually feel warm air? If not, it may take some mechanical help to troubleshoot the system. Don’t let yourself be a “peep-hole” driver, make sure your defroster is working properly. Do they all work? Check both low and high beams. Check that all the other exterior lights are working too: turn signals, marker lights on the sides, license plate lights on the rear. Changing a bulb is not all that difficult on many cars, however make sure the bulb you use is the same part number as the one your are replacing. Just because it will fit the socket does not mean it is the right candlepower (is bright enough) for the application. Do they flash at the correct speed, and at the same speed on both sides? If they flash on one side but the dash indicator stays steadily “on”, on the other side, it is usually a burned out bulb. Do your turn signals cancel after you straighten out the steering wheel? IF not a mechanic may be need to correct the problem. NO one likes to follow someone with their turn signals steadily “on”. These were once an option, but now are generally standard equipment. They should clear the fog evenly across the window, a pattern of alternating foggy and clear stripes indicates one or more burned out heater wires. This often requires replacement of the window, but a chemical anti-fogging agent will make a good substitute. While you are applying the anti-fog chemical, a coat on the side windows is a great idea, too. Clear vision 360 degrees around you is best. The unsung hero of driving safety, your tires need attention to both perform properly and give you the greatest longevity. Look in your car’s owner’s manual for the proper inflation. The maximum inflation on the sidewall of the tire is just that – a MAXIMUM inflation to carry a specified maximum load. If your tire is not so heavily loaded, maximum inflation may not be best. If your owner’s manual doesn’t specify inflation, check with the shop where you purchased your tires for their manufacturer’s recommendations for your specific car and the load you are carrying. Check to see if there is adequate tread depth, cuts, or other damage. 1/16th of an inch is the minimum legal allowable tread depth, but is wholly inadequate for slippery road conditions. There should be no looseness, vibration or unusual noises as you steer, particularly on tight turns. Any of these symptoms may indicate worn parts or a need for service. 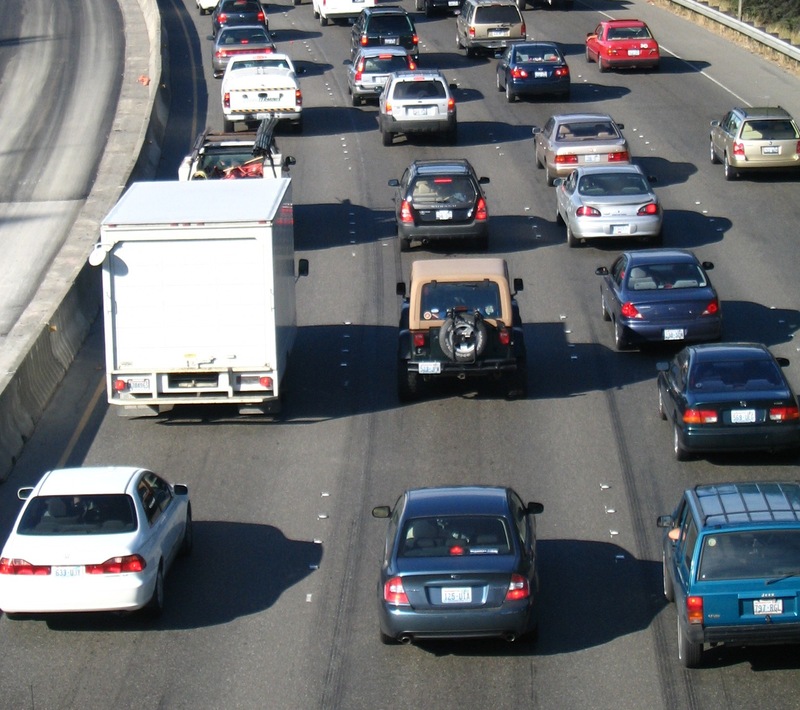 Noise on a tight turn - on front wheel drive vehicles – may indicate a worn constant velocity universal joint. Rust out of your exhaust system components is not common today for two reasons: better materials are used for mufflers and exhaust pipes, and today’s engines and exhaust systems run at hotter operating temps. The higher temperatures cook out any accumulated moisture in the system, thus preventing premature rusting. However physical damage is still a problem. While driving with the car tightly closed due to colder conditions, any leaking of the exhaust could allow carbon monoxide to enter the passenger compartment. Generally today’s heater systems keep the “cabin” slightly pressurized to help prevent “CO” from getting in, but it’s best know there are no leaks. You can learn a lot just by “petting” your tires. Look at your tires; uneven wear can sometimes be seen and the wear pattern tells what caused the uneven wear. Tread worn in the middle, but OK on the outside edges indicates chronic over inflation. The opposite – worn on the outside edges but OK in the middle – indicate under inflation. Feathering of the tread indicates alignment problems. Gently rub the palm of your hand across the tread; if it feels smooth in both directions it’s probably OK, if it feels smooth in one direction but “grabs” your hand in the opposite direction, improper alignment, probably incorrect “Toe-in” is indicated. “Cupping” of the tread – a series of hills and valleys, usually on the outside edge - indicates worn shock absorbers, or other loose suspension parts. Here again, a good shop can tell you what the problem is, and the prescribed correction. Whether your employees drive for work or just do a daily commute, their time on the road is the most dangerous part of their day. Help them focus on safe driving during Drive Safely Work Week, October 3-7. Employers across the Northwest and the nation are taking this opportunity to support the safety and health of their employees by preventing traffic-related deaths and injuries. Deliver a message to your employees that safe driving is a top priority for your organization. Coordinated by the national Network of Employers for Traffic Safety's (NETS), this year's campaign is focused on distracted driving. NETS is providing free resources designed to help employers raise awareness, develop strategies to minimize distractions, launch a new cell phone policy or reinforce an existing one. The DSWW tool kit includes daily messages, activities and downloadable graphics.